The habit of planting grass seed in spring is like so many other habits – it’s hard to break – yes even in lawn care we form habits! In the face of evidence to the effect that fall is the proper time of year to seed a lawn, many homeowners still choose spring. Over the years, however, many of our plant-care.com readers have turned to repairing, overseeding a lawn or reseeding lawns in fall. This is largely because they have had an opportunity themselves to compare spring and fall grass seeding results. In practically all experiments, the best turf has been produced from early September sowing and, strange as it may seem, winter seedings have compared very favorably with those made earlier in the season. Of course, grass from September sowing gets a good start before freezing weather while the winter seedings do not germinate until the following spring. But even so, the turf will develop much more rapidly than if planting had been delayed until spring. Winter seeding is especially suggested where building operations delay the planting of a new lawn. 1 First or all, the weather is more favorable than in the spring. Cool nights, adequate rainfall and good warm soil combine to establish an ideal growing condition. New grass finds such a situation conducive to a slow, normal growth. 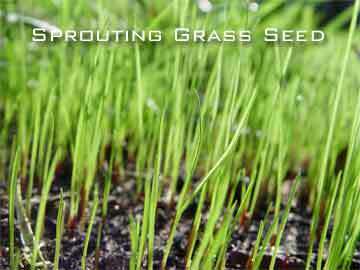 Even when spring grass seedlings are able to get started, many perish from the hot, dry summer. 2 Second, fall sown grasses root more deeply. It is Nature’s precaution against the rigors of winter. The roots from fall grass sowing branch out or stool, thus tending to form a thicker, healthier sod. From spring seeding, grass is inclined to a lush top-heavy growth, whereas in the fall the growing emphasis is more upon root development. Spring seeded grass grows so rapidly that only a weak root system develops. Such roots are unable to get down to the reserve soil moisture and food supply. 3 Third, fall is a dormant period for weeds, and is a good time to work on getting rid of them. They enter upon a season of inactivity which is just the time for new grass to take possession of every available inch of lawn area. When spring comes with its luxuriant weed growth, the new grass from fall seeding will have become firmly established and in good fighting fettle. 4 Fourth, If a new lawn is being started, the soil is readily workable in the fall, while in the spring it is usually too wet to be broken up and put into proper seeding condition. Also, in the spring the soil is too cold for good readily grass seed germination, while in the fall, as already explained, the stored-up heat from a summer’s sun insures quick and maximum growth. “When to seed grass?” is a commonly asked question. Well, the best time to sow grass seed is between mid-August and late October, depending upon the climate. In the extreme north spring seeding is possibly safer. For example, in northern Minnesota it is believed wise to seed in the spring although reports from experimenting there indicate that seeding by the end of August is equally desirable. November or December seeding would be justified if a new lawn could not be made ready for sowing before that date. The new grass from such a lawn seeding will start as soon as the ground warms up the following spring. This grass is certain to develop ahead of that planted in the spring since the latter must be delayed until the ground dries sufficiently to work. Too often such a period does not come until near the season of hot, dry weather. If you have any Fall versus Spring grass seeding experiences, please leave a comment.